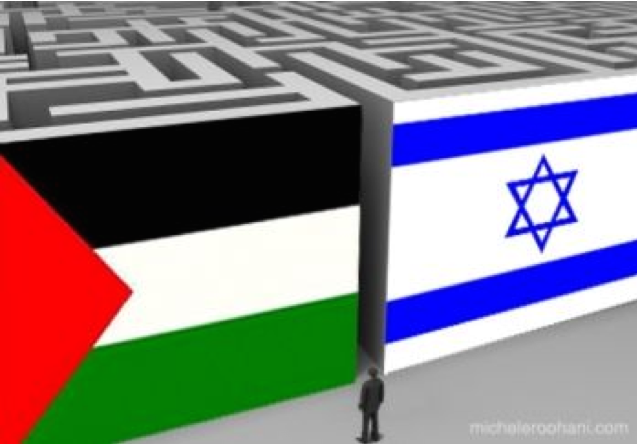 In a paper presented at the 2016 MLA Convention, Bill Mullen gives an overview of the PACBI (The Palestinian Campaign for the Academic and Cultural Boycott of Israel) guidelines for the academic and cultural boycott of Israeli Universities. Bill V. Mullen is Professor of American Studies at Purdue University. He is the author of Un-American: W.E.B. Du Bois and the Century of World Revolution (2015 Temple). He is co-editor with Ashley Dawson of Against Apartheid: The Case for Boycotting Israeli Universities (Haymarket). He is a member of the organizing collective of USACBI (United States Campaign for the Academic and Cultural Boycott of Israel) and faculty adviser to Purdue Students for Justice in Palestine. At the MLA 2016 Convention in Austin, Fady Joudeh, the Palestinian poet and translator, gave a paper that focused on the implicit embargo of Palestinian Literature, which has gone for decades. He discusses the prime but not sole example of such censorship in the example of the poetry of the great late Palestinian poet Mahmoud Darwish. For decades Darwish’s poetry was near-invisible in America, which was all the more noticeable considering his grand stature in the world of letters. More recently, this implicit embargo manifests itself differently, in a lack of exposure in mainstream literary outlets. Currently the situation inside the West Bank and Gaza is essentially one where checkpoints for access to books dominates. Recently, several Palestinian or Arabic authors with Palestinian connections have been denied entry into the US. The implication of this implicit embargo has contributed to the continuation of seemingly inevitable erasure of Palestinian presence especially in the English language. The politics of dispossession and occupation persist in literature. In English there is little meaningful knowledge of Palestinian literature while knowledge, visibility and appreciation of Israeli literature abounds in comparison. Joudah eloquently calls for more translation of Palestinian literature and greater critical interest in Palestinian letters. Fady Joudah is a Palestinian American physician, poet, and translator. He is the recipient of the Griffin International Poetry Prize in 2013, for his translation of Ghassan Zaqtan’s Like a Straw Bird It Follows Me. Joudah’s poetry won the Yale Younger Poets Prize, and his translations of Mahmoud Darwish’s work earned him a Banipal prize from the UK and a PEN USA award. Alight and the ebook Textu, which is composed on cell phone in character count, are his most recent poetry collections from Copper Canyon Press. Below is link to Alex Lubin’s presentation at the 2016 MLA. The paper was given as part of the roundtable “What It Means for MLA Members to Support the Academic Boycott of Israel” (Austin, Jan. 8, 2016). Lubin situates BDS activism in relation to what he calls the de-facto boycott of Palestinians orchestrated by US Foreign policy, analyzing how US affective, diplomatic, and economic investment in Israel contributes to the epistemic and ontological erasure of Palestinians. Lubin is Professor and Chair of the American Studies Department at the University of New Mexico. He is the author of Romance and Rights: The Politics of Interracial Intimacy, 1945-1954 (2005) and Geographies of Liberation: The Making of an Afro Arab Political Imaginary (2014). He is also the editor of Revising the Blueprint: Ann Petry and the Literary Left and the co-editor of American Studies Encounters the Middle East (2016). This essay is a modified version of his chapter in Vijay Prashad’s Letters to Palestine: Writers Respond to War and Occupation (Verso Books, 2015). Sign an appeal to academics around the world to protest France’s law against BDS. Click here to read and sign the petition. US media outlets routinely disregard Israel’s attacks Palestinian universities, and is no surprise that the assaults on Birzeit University and the detention without charges of Palestinian students during the fall of 2015 and in January 2016 have gone unreported. The news of the January 2016 attacks on Birzeit University made the headlines, however, in many regional news outlets, including Aljazeera.com, the Palestine Chronicle, Palestine News Network, the Middle East Monitor, We Watch Israeli Violence. Reporting for Aljazeera, Mariam Barghouti provides the following account of the persistent Israeli assault on the Palestinian university:”About 90 students and two faculty members at University have been arrested in the past few months amid an Israeli crackdown. 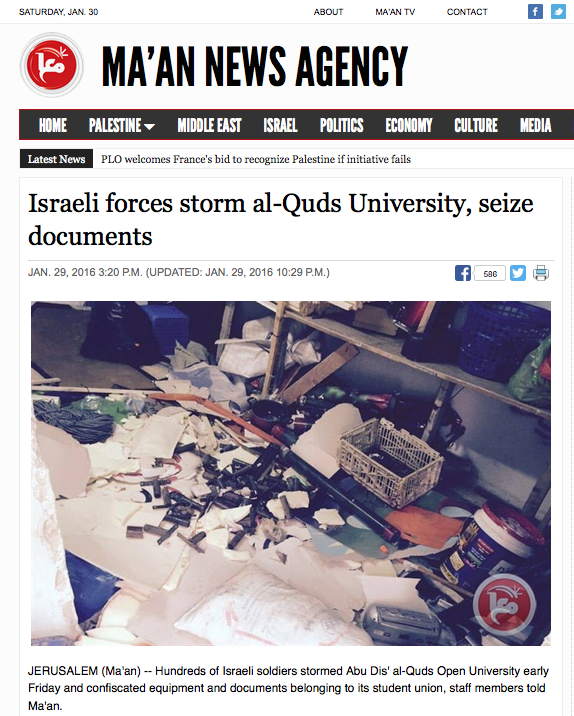 On Monday, Israeli occupation forces raided the university campus and destroyed the offices of the students blocs, according to a post on the university’s facebook page.” (“Birzeit University rises up against Israel’s arrests,” aljazeera.com, 11 Jan 2016).